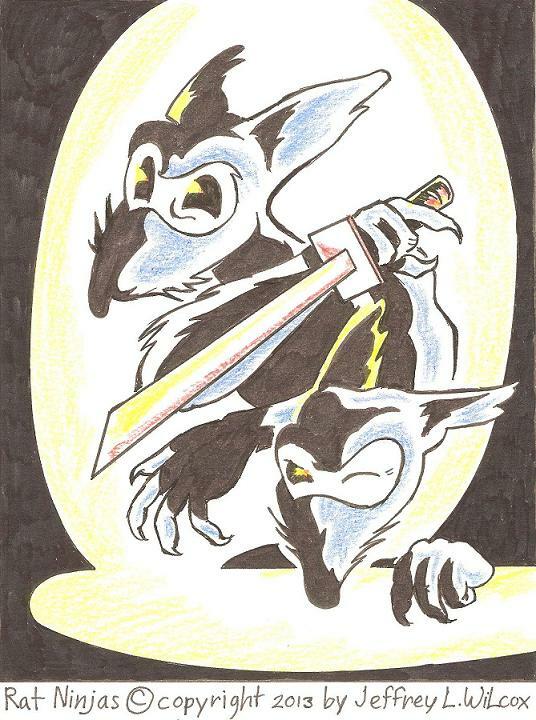 Wilcox Post #2 — Rat Ninjas. Rat Ninjas are apart of a cartoon series I call Foxy and the Toon Agents. This a Saturday-morning-cartoons meets a James Bond-super spy kind of an idea. Needless to say, a herd of cartoon rats( as ninjas) would make for fine villains for the series. Most of the main characters I created last year, and so I’m just throwing in a couple characters I didn’t get a chance to present up till now. For the newbie participants in our art challenge: how do you create 30 characters in 30 days? Well, beside being a natural for creating this kind of art project, what I do is create a series of characters. That is, a person can create a whole world of characters as if you were creating a novel, a movie, or a TV show. You wouldn’t just have one character for the above, you would create a whole cast of characters to play out the story/stories. I mentioned Foxy and the Toon Agents above. In that, I have the lead of the series, Foxy, as a cartoon fox with James Bond abilities(he gets by with his imagination, cunning, and stealthy quickness). Foxy’s big boss at the Toon Agents is Ursa(she’s a real bear to work for). Then there’s Miss Kitty, a Persian cat fem fatale; and Lester, a mouse who thinks enthusiasm and active effort are a replacement for knowledge and experience. And, of course, the villains — Professor Lobo(a mad scientist type) and Agent X(a shadowy figure that uses hulking strength and terror to finish his missions). Take the number of characters I just mentioned and the Rat Ninjas, and that’ll adds up to seven characters. Plus, if you run out ideas for characters in one series, then you can also create other series to help out. Hope everyone here has a great time with the art challenge. I know I will. Thanks for sharing some ideas on how to get through the challenge. I think I’ll slowly evolve these early drawings into a cohesive storyline. If you have any ideas, please share more of your creative process. A lot of storytelling! Thanks for sharing and inspiration.